Pictures of molten chocolate cakes are always gorgeous. A rich, warm sponge which encases a gooey chocolate sauce that oozes out over the plate. I’ve tried to make these fabulous creations twice now and always come across the same problem – all the recipes I find make enough mixture for at least four portions. Boyfriend and I live alone, so I always try and reduce the recipe so there are only two portions – this is never successful. 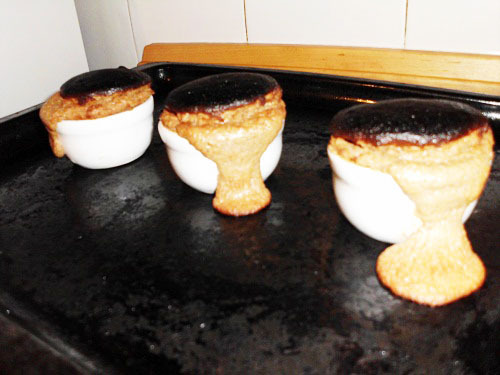 If you want to make overflowing warm mousse with a blackened soufflé top, follow these tips very carefully. If you follow those tips correctly, you should be left with a horrible Yorkshire pudding-tasting undercooked soufflé/mousse, as well as a very disappointed boyfriend. Hopefully the next time I try to make these, I get to update my blog with a successful post and show off tempting photos of what these gorgeous treats really should look like. Last week I decided to make a start on my Halloween baking. I know it’s only September, but October 31st will be here before we know it. I played it safely and used a favourite recipe of mine which I’ve made many times and jazzed it up with Halloween decorations. I was so worried that my oven was going to completely destroy my works of art that I took a picture of the raw pastry before I put them in the oven, just in case. 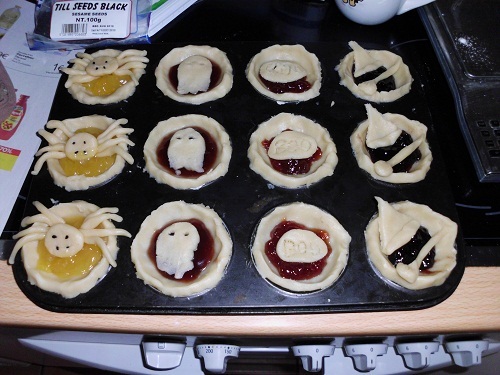 Fortunately, the tarts and the decorations kept their shapes really well – even though one unlucky ghost drowned in jam and a spider received a few broken legs. 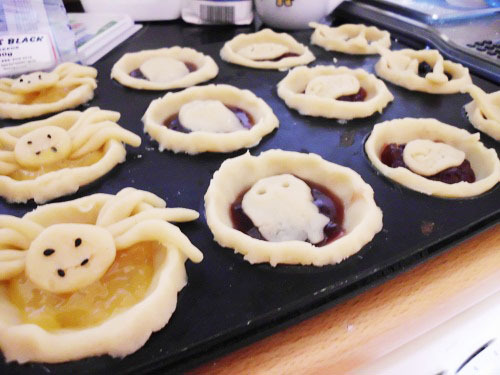 I fashioned spiders, ghosts, ovals with ‘BOO’ written in them and witches hats and broomsticks out of the same pastry used for the rest of the tarts. The spiders definitely took the longest and were the most fiddly, but I think it was definitely worth it. The spiders were made by rolling a ball of pastry, attaching pastry legs, a cocktail stick to carve a mouth, and poppy seeds for the eyes and fangs. For the ghosts, I rolled out an oval of pastry and dragged my fingers down it so the bottom thinned out – the eyes were simply holes. 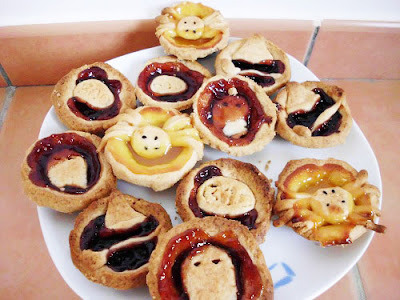 I carved the word ‘BOO’ by dotting with a cocktail stick and the witch tarts were made just by rolling pastry into the desired shapes. This recipe makes 12 jam tarts. 1. Heat the oven to 180C and grease a very shallow muffin tin. 2. Combine the flour, salt and sugar. 3. Chop the butter and lard into small cubes and add to the flour. Rub the fats into the flour with your hands until the mixture resembles coarse breadcrumbs. 4. Add a few drops of water at a time until the mixture forms a good dough. You should need somewhere between 1tbsp and 2tbsp. 5. Knead the dough before rolling it out and use a cutter to cut out circles and place in the muffin tins. Tidy the edges of the pastry so they’re neat. Put the remaining pastry to one side. 6. Place very small amounts – between a teaspoon and tablespoon – of your chosen jam, curd or marmalade in each tart. 7. 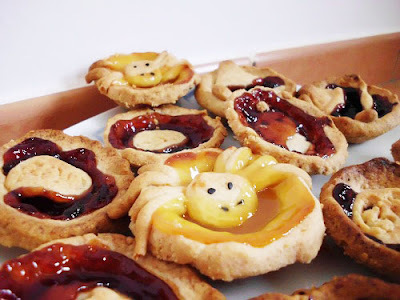 Make decorations out of the remaining pastry and place on top of the tarts. 8. Place in the oven until golden brown – about 20 minutes. Last weekend, the Degusta.Me food festival was held in Adeje and Boyfriend and I thought it sounded fun. There was a variety of cold and hot tapas available, as well as rivers of wine. For just €1, you could purchase a large engraved wine glass and fill it for only €1 each time. All the tapas selections were also really cheap, ranging from €1 to €3 each. This food festival was to celebrate the diversity of restaurants in the region and encourage people to venture out of their houses and discover the culinary delights which are on their door step. One of the first stalls Boyfriend and I visited first offered a variety of hot and cold tapas including a rather bizarre pasta dish. In a small plastic cup was some home-made pasta stuffed with something that had the colour of minced beef, the texture of paté and a really sweet taste. I’m still not quite sure what it was, but my best guess is some kind of cheese, or possibly ‘gofio’. 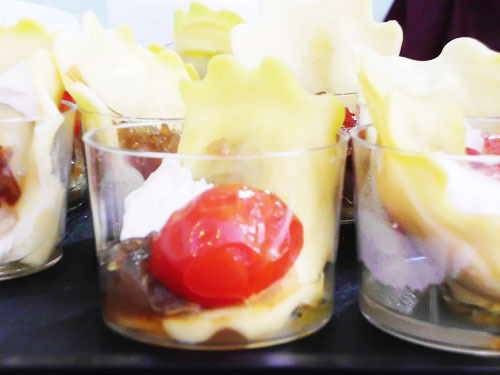 To complement the pasta was a small portion of delectable goats cheese, alongside a roast cherry tomato and gorgeous caramelised onions. Next we moved onto a stall that had an open barbecue, on which stood some warm, toasty buns and huge chunks of pork and crackling. After taking our €2 ticket, a woman cut some chunks of pork and crackling and gave them to us while we were waiting for her to assemble the sandwich. They tasted so fantastic that we just wanted to devour the whole tray there and then. 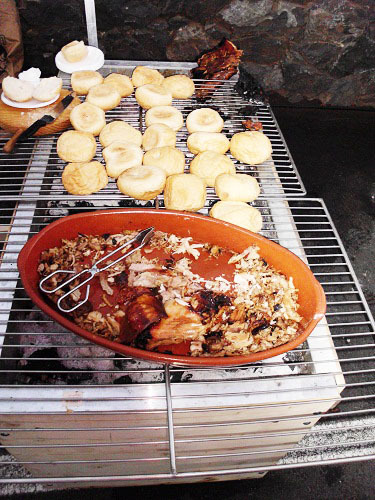 Mounds of pork were stuffed into the white, crusty bun, before being lathered with a typical Canarian sauce – gorgeous. 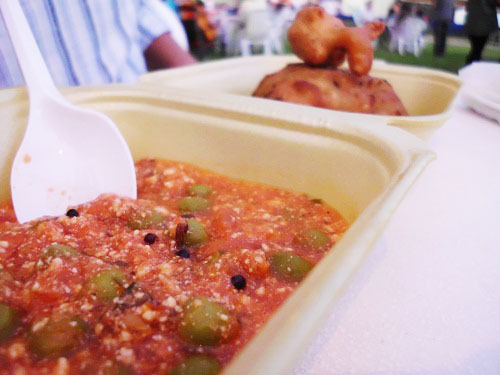 Next was a stop at what turned out to be Boyfriend’s favourite stall – a Harry Chrisna stall, which served vegetarian food. We were given a dish which contained a tomato and yoghurt based sauce, flavoured with a hint of Indian spices. The other half of the container held a potato-based vegetable mix, coated in batter and deep fried. 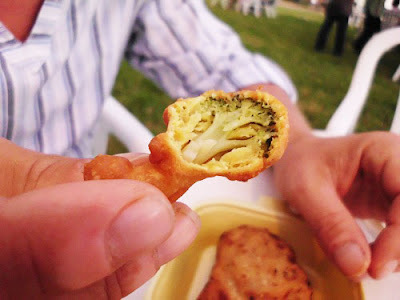 There was also a deep fried piece of broccoli, which I thought looked fantastic. The chef had somehow managed to cook it at the perfect temperature to brown the batter and make it nice and crispy, whilst still allowing the delicate vegetable to remain perfectly intact. It’s autumn and in most countries throughout Europe, the sun has been replaced with thin, greying clouds, the air is full of cool breezes and the sky is alive with masses of colourful leaves. Tenerife doesn’t seem to have noticed that summer is over – every morning I still wake up to the perfect weather for a long, lazy day at the beach. Even though the weather here still strongly resembles summer, I saw so many autumn recipes circulating throughout the rest of the online baking community and couldn’t resist trying some of my own, and what better way to welcome autumn than with a fresh-out-the-oven, warm apple pie? Rather than making one huge apple pie, I made small individual ones. That way, I can convince myself that it’s perfectly okay to have two because they’re only miniature! These pies would be perfect to share whilst cuddling under a blanket in front of a fire on a dark, chilly autumn evening. This recipe does take quite a while to follow, but it is definitely worth the effort. The crumbly pastry and sweet topping give way to the gooey, fragrant apple centre when you bite into this sumptuous treat. If you’re looking to make a dessert out of this, try adding caramelised apple chunks and cream – gorgeous! This recipe yields 12 mini apple pies. 1. Preheat the oven to 200C. Mix the flour, salt and sugar together in a bowl. Chop the butter and lard into small cubes and add into the bowl with the flour. Rub together with your hands until you have a mixture which resembles fine breadcrumbs. 2. Add drops of water until the mixture is thick enough to roll into a dough. This should be somewhere between 1 tbsp and 2 tbsp. Knead the dough for around five minutes. 3. Grease a 12-muffin muffin pan. Roll out the dough so it’s about 1cm thick and using a cutter, cut out circles big enough to fit into the muffin moulds about 3/4 way up. Place dough circles in the muffin pan so they form cups. 4. Place in the oven for around 10 minutes to ensure the pastry cups cook well. Remove from the oven and leave to cool. 1. Peel both apples and chop them into small cubes. Place in a pan over a medium heat with the butter, sugar, cinnamon and nutmeg. Cook just until the apples are soft, then remove from the heat. 1. Combine the flour and sugars together in a bowl. 2. Rub in the butter with your hands until the mixture resembles breadcrumbs. 3. Sprinkle the topping over the apple pies so all chunks of apple are covered. Place in the oven for around 20 minutes until golden brown. I really enjoyed writing about carnival food in Tenerife – specifically the papa asada – in a previous post and thought it deserved a follow-up. Every time I think of this fiesta feast I uncover a montage of memories – everything from winning a fluffy tiara the first time I had one, to Boyfriend being ill all over the floor the first time he had one. Take Boyfriend’s advice – don’t eat fast food before going on fast rides which spin around and around… It doesn’t end well. 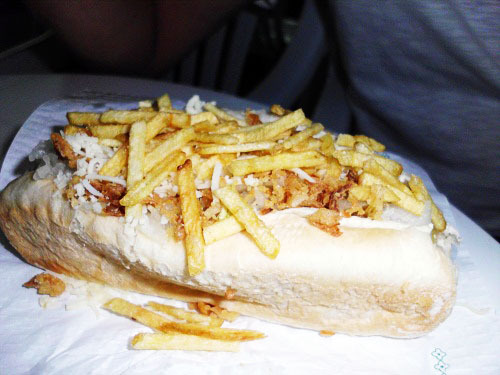 The star of this post is the perrito caliente especial – or the special hot dog. Just like the papa asada, this hot dog can be mistakenly underrated from just a glance – everything is just piled on top carelessly. It starts off as a jumbo hot dog placed in a soft white bun. Layers of ketchup, mustard and mayonaisse are slapped on top, forming the perfect bed for oodles of crispy onion bits, mounds of cheese and fine, salty chipsticks. Generally, I do not condone fast-food, but this has got to be my favourite I-cannot-even-kid-myself-this-has-any-nutritious-value food. From the bun loaded with complex sugars and the hot dog made from a negative percentage of ‘meat’, to the full-fat mayonaisse and the deep-fried chipsticks, this treat does nothing for my health, but does wonders for my happiness. The most difficult and only disappointing part of eating a perrito caliente especial is that most of the chipsticks fall on the floor, the crispy onion lands in your lap and the sauces gloop all over your clothes. Luckily for me, my mouth is so huge that I can overcome all these problems.